Percy Jackson & The Lightning Thief: Modern And Mythical Worlds Collide in this thunderous fantasy-adventure starring Pierce Brosnan, Steve Coogan and Uma Thurman as you've never seen them before! Percy Jackson is no ordinary teenager....he's just learned he's the son of Poseidon and is accused of stealing Zeus' lightning bolt - the most powerful weapon ever created! With storm clouds brewing, Percy embarks on an incredible cross-countr..
Modern And Mythical Worlds Collide in this thunderous fantasy-adventure starring Pierce Brosnan, Steve Coogan and Uma Thurman as you've never seen them before! 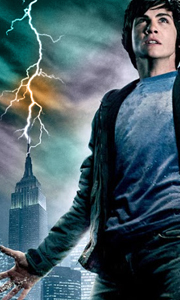 Percy Jackson is no ordinary teenager....he's just learned he's the son of Poseidon and is accused of stealing Zeus' lightning bolt - the most powerful weapon ever created! With storm clouds brewing, Percy embarks on an incredible cross-country journey with his new friends to pro..
Percy Jackson - Sea Of Monsters: The magical, mythical adventures of teenager Percy Jackson - son of the Greek god Poseidon - continue in this heroic, action- packed thrill ride! Out to prove he's not just a "one-quest wonder," Percy and his demigod friends embark on an epic journey into the treacherous Sea of Monsters, where they battle terrifying creatures, an army of zombies, and the ultimate evil. With time running out, Percy must f..
Own Percy Jackson - Sea Of Monsters / Percy Jackson & The Lightning Thief DVD from Deff, DVD, Blu-Ray & 4K Video Specialists - Free UK Delivery.. The magical, mythical adventures of teenager Percy Jackson - son of the Greek god Poseidon - continue in this heroic, action- packed thrill ride! Out to prove he's not just a "one-quest wonder," Percy and his demigod friends embark on an epic journey into the treacherous Sea of Monsters, where they battle terrifying creatures, an army of zombies, and the ultimate evil. With time running out, Percy must find and bring home the fabled Gol..